Optimize peritrabeculectomy clinical care to minimize risk for bleb-related infection. Recognize risk factors, signs, and symptoms of bleb-related infection. Diagnose and manage individual cases of EKC. Implement procedures to prevent the spread of adenovirus within healthcare facilities. Develop a risk-stratified plan for long- and short-term blepharitis treatment. List potential approaches to Demodex infestation. Describe current trends and practice patterns of antibiotic prophylaxis against endophthalmitis during cataract surgery in the US. Improve prophylaxis of endophthalmitis in cataract surgery with appropriately selected intracameral antibiotics. 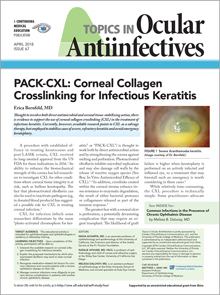 Interpret the available research on corneal collagen crosslinking for infectious keratitis. Explain the proposed mechanisms by which photoactivated riboflavin may work to treat corneal infection. Recognize medication-related risk factors for common infections and counsel patients with a chronic ophthalmic disease on their risk. Manage common infections more diligently to prevent serious complications in patients with another chronic ophthalmic disease. Discuss current diagnostic and treatment issues in acute conjunctivitis. Improve management of acute conjunctivitis by adopting evidence-based prescribing. Describe the benefits and risks associated with the use of compounded ophthalmic antibiotics. Describe strategies to minimize the risks of using compounded antibiotics. Uncover possible immune deficiency and infection risk factors in their patients. More quickly and accurately diagnose infection in immunocompromised patients. Describe the shifting trends in the epidemiology of herpes zoster. Educate and advise eligible patients to encourage adoption of zoster vaccine. Describe the clinical presentation of common infections of the ocular surface and anterior segment associated with HIV/AIDS. Describe the key elements in diagnosing and treating infections of the ocular surface and anterior segment in patients suspected of HIV infection. Employ a combination of fortified agents to treat potentially serious corneal ulcers. Factor antibiotic generation into clinical decision-making in the treatment and prevention of ocular infection. Recognize limitations of generational antibiotic categorization. Explain changing trends in antibiotic resistance to common ocular pathogens and the techniques used to establish these. Describe strategies for minimizing antibiotic resistance through changes in clinical practice. Analyze the advantages and disadvantages of currently available intraocular antibiotic prophylaxis methods. Choose appropriate antibiotic prophylactic regimen in cataract surgery based on efficacy and safety considerations. Improve diagnosis and management of KC and BKC. Identify and mitigate risk factors for ocular surface infection. Generic vs. Branded Antibiotics: Do the Differences Matter? Articulate risk factors for bleb-related infection. Detect and take appropriate initial steps to manage bleb leak and related infection. Improve clinicians’ drug selection by identifying patient/disease situations in which there may be clinical reasons to consider branded drug rather than generic. State two reasons why differences in the formulations may matter more for topical ocular drugs than oral agents. Explain changing trends in infectious keratitis following LASIK. Minimize the risk of flap-related infections in LASIK patients by improving surgical and clinical approaches. Describe factors related to the increase in fungal infection incidence following corneal transplantation. Reduce risk for bacterial and fungal infection in corneal transplant recipients. Recognize a herpetic etiology in patients with anterior uveitis based on distinctive clinical findings. Formulate the appropriate treatment strategy for presumed or proved herpetic anterior uveitis to reduce tissue damage and serious complications. Obtain an adequate ocular tissue sample to identify pathogens present in superficial ocular infections. Determine which cases are most in need of microbiology laboratory assessment. Discuss the therapeutic potential associated with microbiome modulation. Describe the status of ocular surface microbiome characterization. Make timely diagnosis of Acanthamoeba keratitis based on patient’s history and clinical findings. Choose appropriate antimicrobial therapy for patients diagnosed with Acanthamoeba keratitis. Identify patients at risk for MRSA colonization. Design strategies to reduce MRSA transmission in the clinic and operating room. Identify signs and symptoms of exotic ocular infections that are present in the West. Conduct a thorough history when exotic infection is suspected. Distinguish presentation of typical vs. atypical postoperative infection. Lower their rates of missed diagnosis of rare organisms. Make maximally effective treatment decisions, employing both the older and newer generation fluoroquinolones. Design treatment protocols that minimize the risk of provoking fluoroquinolone resistance. Discuss the advantages and disadvantages of current antiinfective prophylaxis options for cataract surgery. Establish an antiinfective prophylaxis approach in clinical practice that effectively minimizes cataract patients’ risk of endophthalmitis. Consider and recognize Demodex infestation in patients with anterior blepharitis. Formulate a staged treatment strategy for patients with staphylococcal blepharitis. Refine their practice of ocular culture and transport for a range of infection types. Interpret reports from microbiologic laboratory more effectively. Name two factors that distinguish possible treatment options for adenovirus conjunctivitis. Describe the ways in which generic drugs can differ from their branded predecessor and discuss possible clinical consequences of those differences. State the advantages and potential downsides of high viscosity agents used to prolong the on-eye residence time of topical ophthalmic drugs. Articulate a protocol for isolating, diagnosing, and managing patients with ocular adenovirus infection. State two virulence factors produced by P. aeruginosa. Identify corneal ulcer patients at high risk for P. aeruginosa keratitis and promptly initiate appropriate antimicrobial treatment. Devise effective strategies for antimicrobial selection in an environment that is becoming increasingly rife with drug-resistant pathogens. Select appropriate agents for the empirical treatment of suspected MRSA infections. Recognize the potential for MRSA infection and select appropriate antibiotics for empirical treatment prior to receipt of culture results. Select appropriate antibiotics for the management of blepharitis. Evaluate orthokeratology as an option for the reduction of myopia progression in young patients. Reduce patient morbidity through earlier detection of atypical ocular viral disease. Improve outcomes in patients with ocular infections by taking the growing prevalence of multidrug resistant organisms into account when planning antibiotic treatment. Employ key strategies for the treatment of infectious vs. inflammatory HSV keratitis. Describe distinctions between chlorotaurines and conventional antimicrobial agents. Determine the potential risks and benefits of adopting intracameral antibiotic prophylaxis in their own surgical center. Explain biofilm resilience, specifically, a biofilm’s high tolerance of antibiotic therapy and discuss the clinical importance of biofilms in device-related infections. List three risk factors for polymicrobial infection. Identify diagnostic techniques for ocular infection. Describe organisms that are associated with one another in concomitant infections. Combination Multidrug Therapy to Combat Increasing Drug Resistance: A Double-Edged Sword? Employ more effective regimens for the prevention and treatment of ocular infections, particularly infections caused by antibiotic-resistant bacteria. Identify and treat the infectious complications of ocular rosacea. List three clincal situations in which photochemical therapy may be of benefit. List four factors that may increase a patient’s risk of infection after an open globe injury. Take preventative measures, including prompt wound closure and early use of systemic and topical antibiotics, to reduce the risk of posttraumatic endophthalmitis. List three potential causes of a negative bacterial culture. Discuss the positive uses of a negative culture. Institute appropriate therapy earlier in the course of challenging cases of infectious keratitis through use of optical biopsy to make or confirm diagnoses. Identify clinical situations in which confocal microscopy is likely to be of benefit. List and discuss risk factors for infection following penetrating and lamellar keratoplasty. List the most common pathogens associated with anterior uveitis and corneal epitheliitis. Compare and contrast the timing of intraocular infections in regards to the source of infection. Discuss the diagnostic approach to anterior uveitis and corneal epitheliitis. List and discuss the indications for various treatment modalities for anterior uveitis and corneal epitheliitis. Generic vs. Branded Antibiotics: Are There Differences? Do They Matter? Make more accurate diagnoese of EKC through improved use of clinical evidence and advanced diagnostic tools. Improve EKC treatment and patient counseling to lessen patient discomfort and prevent spread of EKC and associated ocular morbidity. Improve clinician’s drug selection by identifying patient/disease situations in which there may be clinical reasons to consider branded drug rather than generic. State two reasons why differences in teh formulations may matter more for topical ocular drugs than oral agents. Describe the benefits and risks of intracameral cefuroxime prophylaxis in cataract surgery. Evaluate the impact of adopting cataract prophylaxis regimen that incorporates intracameral antibiotic injection. Reduce the risk of herpetic keratitis recurrence as a consequence of excimer laser refractive surgery in patients with a history of herpesvirus outbreaks. Describe an appropriate prophylactic regimen for a refractive surgery candidate with a history of epithelial HSV keratitis. Describe risk factors for acquisition of atypical ocular infections.